North Korea has "at least one other" uranium enrichment site in addition to the one shown to US experts last month, the US State Department has said. The country's enrichment programme "reflects work being done at at least one other site", a spokesman said. A New York Times report quoted unnamed intelligence officials, saying North Korea was using "significantly more advanced" nuclear technology than Iran. Enriched uranium can be used for nuclear fuel or made into weapons. North Korea revealed what appeared to be a fully operational uranium enrichment plant at its Yongbyon atomic complex to US nuclear expert Siegfried Hecker on 12 November. Officials in the US and South Korea have said in recent days the facility shown to the expert last month could not have been constructed so quickly if other secret sites or another completed uranium enrichment plant did not already exist in the country. "We're very conscious of the fact that, in the recent revelations to American delegations, what they saw did not come out of thin air," US state department spokesman Philip Crowley said. "It certainly reflects work being done at at least one other site." South Korean Foreign Minister Kim Sung-hwan would not confirm a media report that Pyongyang had three to four plants to enrich uranium. 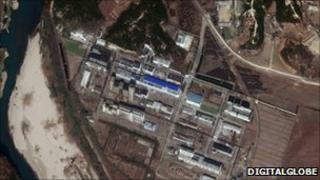 But Mr Sung-hwan said he believed there were facilities in North Korea aside from the Yongbyon site. "It is a report based on what is still intelligence and let me just say that we have been following this issue for some time," Mr Sung-hwan said on Tuesday. Meanwhile, Governor Bill Richardson of the US state of New Mexico said on Tuesday he hopes to reduce tensions on the Korean peninsula during an upcoming trip to the North - one prompted by an invitation from the North Korean authorities. The news comes weeks after North Korea shelled Yeonpyeong, a small South Korean island, following Southern naval drills near a disputed maritime boundary, killing four people.